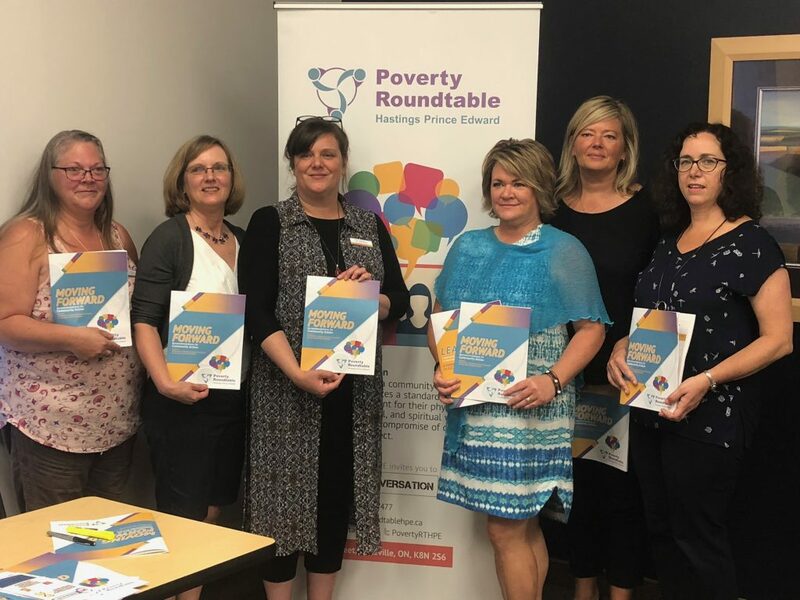 BELLEVILLE – Poverty Roundtable Hastings Prince Edward released their 28 page report “Moving Forward – Recommendations for Community Action” Tuesday as a call to action to individuals, groups, organizations and all levels of government to address poverty in the area. The report is a culmination of two years of conversations with over 2,000 people, including community members and people who have lived in poverty, about the best strategies to tackle it. It follows their previous report, “Leaning In” which outlines the causes and realities of poverty in Hastings Prince Edward. “Knowing the causes of poverty means that we can advance our mission to eliminate the causes of poverty,” said Christine Durant, director of the roundtable. Belleville has the sixth highest rate of urban childhood poverty in Canada at 20.5% , the food insecurity rate for Hastings Prince Edward is about 10% to 14%, and 35% of Hastings and 26% of Prince Edward’s single parent families are living in poverty, according to the report. 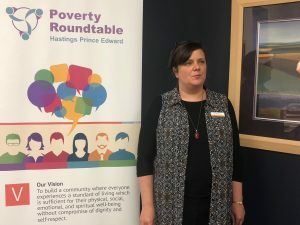 Tami Downes, vice-president of CanGrands, a national kinship support group, and a member of the steering committee for the roundtable has first-hand experience with poverty. As a grandmother raising her 13-year-old granddaughter, Downes says she is granted a temporary care allowance of $269 a month, while foster parents receive $920 a month. This disparity deepens the poverty level for anyone living in it or close to it, she said, and doesn’t offer the same allowances for kinship as foster children, such as a winter or school clothing allowance. “We need more money. We need more resources. We need more community involvement to keep these kids out of poverty,” Downes said. The document makes recommendations in nine priority areas, indicating if the action should be taken on a community, municipal, provincial or federal level. These areas are income and employment security, housing security, transportation access, health equity, families and caregivers support, food security, belonging and inclusion, rural poverty and financial empowerment. Several other community partners with the roundtable said they were excited about the direction this report can take Hastings Prince Edward. “The [report] provides a really great opportunity for us to see where we can more actively engage in advocacy work, mobilization and investment in some of the pressing issues people who are in living in poverty are facing, and we’ve never before had the data from people who are living in poverty telling us what initiatives will really make a difference in their lives,” said Brandi Hodge, United Way Hastings Prince Edward‘s director of community engagement. “What I’m most excited about this is that it puts all of these issues into one report that anybody can take, whether you’re an individual, whether you’re an agency, whether you’re in a municipal or provincial or federal government, you can take this and there’s something in here you can do,” said Ruth Ingersol, executive director of Community Development Council of Quinte. It will take a lot of community effort and co-ordination, says Deirdre McDade, a lawyer at the Community Advocacy and Legal Centre. The level of poverty in the area isn’t okay and the community cannot get comfortable with it, said Durant. “There is a role for everyone to play in eliminating poverty in Hastings Prince Edward and it’s important we do so,” she said. With the upcoming provincial election, the roundtable will be hosting an all-candidates meeting for the Bay of Quinte riding on Thursday to ask candidates how their parties plan on addressing poverty.